Juniors Heat Sensitive Spoon - Set of 3 | Blue | Strong, durable and hygeienic for babies and toddlers. Shaped for little hands to hold. 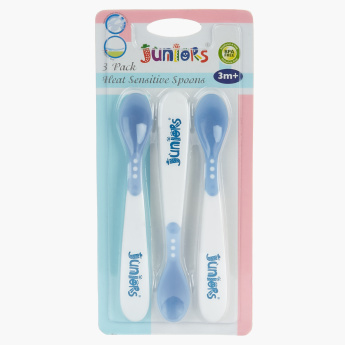 Feed your little one with absolute ease and comfort with this heat sensitive spoon. Shaped for little hands to hold, this spoon is strong, durable and hygienic for toddlers. The unique heat-sensitive feature helps you gauge whether the food is too hot. These spoons come as a pack of three and sport a simple yet attractive design. Feature 2 : The unique heat sensative feature helps to tell you when the food or drinks is hot. Feature 1 : Strong, durable and hygeienic for babies and toddlers. Shaped for little hands to hold. Feature 3 : Soft handle to easy grip.